Recently, a friend of mine asked me a simple question, "How do you keep it all together?" As someone who struggles with Bipolar Disorder, there is no simple answer to this question. There are days where it is difficult to get out of bed, to shower, to clean my house, to do simple tasks like get dressed. There are other days where I come home, utterly and completely exhausted, and I beat myself up. How come I am so worn out? I didn't do that much today, I don't have a physically exhausting job, am I just that lazy? But then I remind myself. When you are struggling with depression, getting out of the house, getting to work, smiling and joking with my coworkers and listening and counseling people is a lot of work. No wonder I'm tired. I have dealt with Bipolar disorder for the last 17 years, I have been medicated for my entire adult life, I have had up and downs, good moments and ugly moments. So how have I been able to accomplish things? How do I raise children, work as a counselor, support my husband, write, teach and serve at church? At the risk of sounding cliche, it's one word: God. There are days where I am worn out emotionally, but the moment that first client steps in my office, I am animated, engaged and present for them. I can see eight clients back-to-back, and feel excited and involved as a counselor. The verse from Phillipians 4:13 goes through my head often as I drive home from work: "I can do all this through him who gives me strength" (ESV). I can literally start my day completely depleted, and leave feeling strengthened and energetic. I know that is God's strength, not my own. 1. Acknowledge your limitations. I almost cringe while writing this. I don't want anyone to feel like I'm implying that people with mental health issues are limited. There are many amazing people who have diagnoses that do incredible things. However, for me, I have learned that due to my mental health, I do have limitations. I have been blessed to be able to work, and I think that my own mental health issues make me a very empathetic counselor. Self-harm? I've done it. Terrible self-esteem? Been there. Poor choices that hurt others? Check. When I look at my clients, who are struggling with self-doubt and frustration about their mental health, I get it. However, I have also learned that I can really only work part-time. I am an extrovert, and I love my job, but if I overextend myself, I end up completely shattered. I have learned that overextension leaves me depressed to the point of not being able to function, and I end up stuck coping with mood swings and irritability towards my family. I used to beat myself up for not being to "do more," but the reality is I have to work within the parameters that my mental health gives me. There are periods of my life where I can do more, there are other periods where I have to turn down opportunities and practice lots of self-care. Now, this is different for everybody. Don't run to a family member with Bipolar and say, "limit yourself." Some people can do more, some have limits. However, for myself, I do feel like accepting those limits and asking God to let me be the most effective woman I can be in a part-time manner has been helpful. 2. Accept yourself. I often tell clients that there is a grief process that occurs with a diagnosis. When a client is diagnosed with a chronic medical issue like diabetes or fibromyalgia, there is an acknowledgement that it takes time to accept that diagnosis. Many people with mental health issues have to go through that same acceptance. There is a grieving process, a sense of "I may never be 'normal' again." That is a painful process, one I spent most of my twenties dealing with. I grieved having to be on medications that often have funky side effects, I felt incredible guilt that I took Bipolar medications while pregnant, meaning I also couldn't breastfeed (off my medications, I get incredibly suicidal and depressed, so we decided that the risks were outweighed by the benefits). Denial. I thought "maybe I'm not really Bipolar" which led to going off my medication, which led to crazy mood swings and my spouse asking me to go back on them. Anger. I wondered "why would God make me this way?" and struggled with a crisis of faith. Bargaining. "Maybe if I just pray more, or am a better Christian, I'll be healed and be fine." Depression. "This is it, I'm always going to be a mess." Acceptance. It took a decade to get here, but I am at peace with my diagnosis. 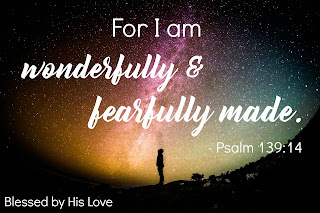 I believe that it allows me empathy for my clients, I love my creativity, and I know that Psalm 139:14 is 100% true: "I praise you, for I am fearfully and wonderfully made. Wonderful are your works; my soul knows it very well." Bipolar disorder is the thorn in my side, but it is who I am. I do believe that whether God created me this way, or it's simply a side effect of bad brain chemistry and a fallen world, I am wonderfully made and I know that God has a beautiful plan for my life. 3. Redefine healing. I spent most of my twenties wanting to be healed from Bipolar disorder. I resented medication, I resented grieving, I resented being terrified through two pregnancies that the medication I take would cause side effects in my unborn babies. I cried out to God to heal me, but still struggled. This changed a few years ago. I was driving home on a beautiful night from my job where I had been able to help others who were struggling, and Chris Tomlin came on the radio singing, "My God is healer, awesome in power, my God, my God." And it hit me like a stack of bricks. I was healed. No, I wasn't free from my disorder, but I was a functional, happy, blessed human being who God had allowed to do some pretty awesome things. If someone loses a limb, we don't expect healing to be that they grow a new leg. Instead, we view them with awe that they have been able to get through something incredibly difficult, then do awesome things! I realized that instead of waiting for complete healing, I could view it as I was doing incredible things with Bipolar. And just as someone who is an amputee runs a race inspires us, I hope that even when I have days where I can't get out of bed, where my irritability makes me prickly, or I can't sleep because I'm hypomanic, my peace, acceptance, encouragement and empathy for those who are hurting inspires others. I've learned to shift my focus from feeling resentful and angry to incredible joy. God has given me great medication, an awesome psychiatrist, the most understanding husband ever, a support network beyond my wildest dreams, a beautiful home, wonderful children and incredible life. One that is rich and in spite of my mental health, or maybe because of my mental health, I don't take it for granted. "But he [the Lord] said to me, “My grace is sufficient for you, for my power is made perfect in weakness.” Therefore I will boast all the more gladly of my weaknesses, so that the power of Christ may rest upon me. For the sake of Christ, then, I am content with weaknesses, insults, hardships, persecutions, and calamities. For when I am weak, then I am strong." It is when I am "weakest" that God allows me to be strong. Some day, God might heal me completely, and I would not complain. 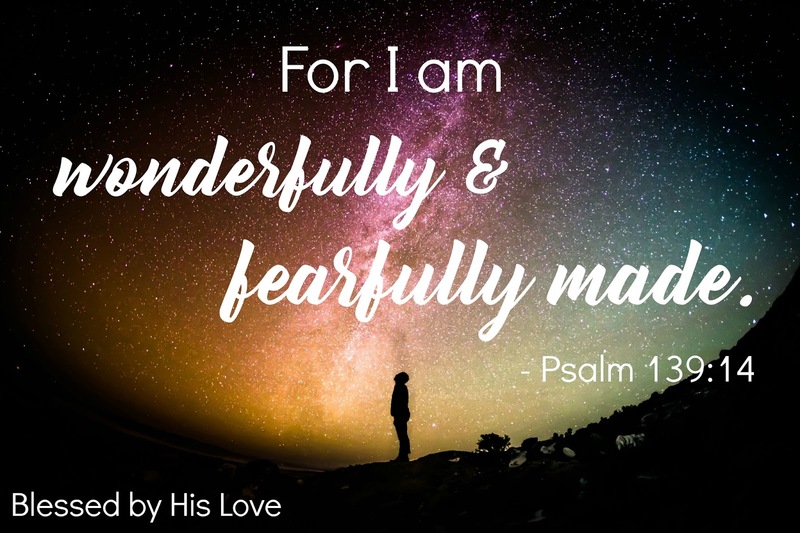 However, for now, I am just incredibly grateful and can proudly say, "I am wonderfully and fearfully made." Bipolar and all. I love this so much, Hilary! As someone else who has mental health issues, your openness in sharing your struggles and triumphs is so refreshing and appreciated! Great truths here. Super great - and love the DABDA application and good analogy of someone losing their leg and healing differently. Such a social worker you are... Love you! Love this! I have a cousin who is also in ministry and struggles with Bipolar Disorder. I really appreciate your open honesty! Thank you for sharing. I love everything you wrote. Such a great example for others who struggle with something similar. Such a beautiful post. Thank you for sharing your journey--I feel like it applies to all of us no matter what our story. These points are wonderful, for people coming from all walks of life. May you continue to be certain of God's presence and hand in the day to day of your life! Praise God that He helps us in our weakness! We are all weak in some way, and He knows that. He knows that we are but dust. Thank you for this post! "I was healed. No, I wasn't free from my disorder, but I was a functional, happy, blessed human being who God had allowed to do some pretty awesome things." I have been diagnosed with POTS (neurological disorder) and as recent as Wednesday with hypothyroidism. I resonate so much with the struggles and with your tenacity to live as one healed and to bless others through what God has given you!